A grand old lady passed away earlier this year. Actually not that old, just 54, the same as me. She was sleek and elegant, a classic beauty and much loved by everyone who knew her. 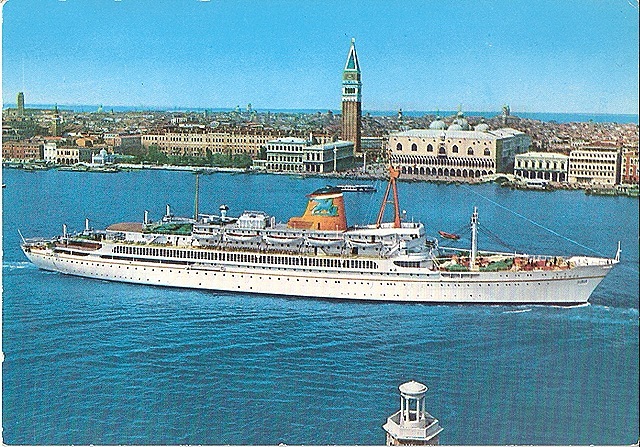 Her name was Ausonia, a true vintage cruise ship built for the Adriatica Line and launched in 1956. 11,879 gross registered tons, she could carry 530 passengers and a crew of 215. She was the fastest and largest liner operating in the Med at that time. I had the good fortune to travel on her in 1966 from Venice to Beirut when we were both only 10 years old. 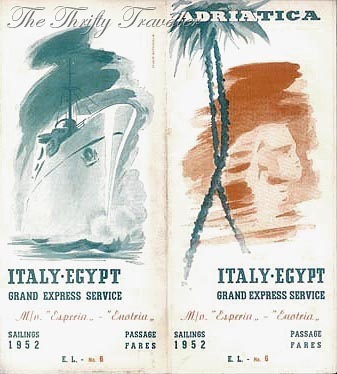 My father had been posted to Lebanon and instead of flying there from UK like most normal people, Dad wanted to drive from England to Venice (via Belgium, France and Switzerland) and continue the rest of the way by sea. So together with Mum that is what we did. At the dock in Venice our brand new Vauxhall Viva SL was hoisted onto the deck with a few straps and a net. It was my first time outside of Britain and a great adventure. Being an Italian ship. the food on board was amazing, with 5 course lunches and 7 course dinners. I put on about a stone in a week! The Italian crew were very friendly, especially to me being a ‘cute bambino with chubby cheeks’. After leaving Venice we stopped at Brindisi, Heraklion and Alexandria before arriving in Beirut. When we left Beirut for good two and a half years later, we did the same journey in reverse, this time on board a sister ship, the Esperia. Though a smaller and older vessel, being completed in 1949, the voyage was equally enjoyable. The Esperia was scrapped in 1973. 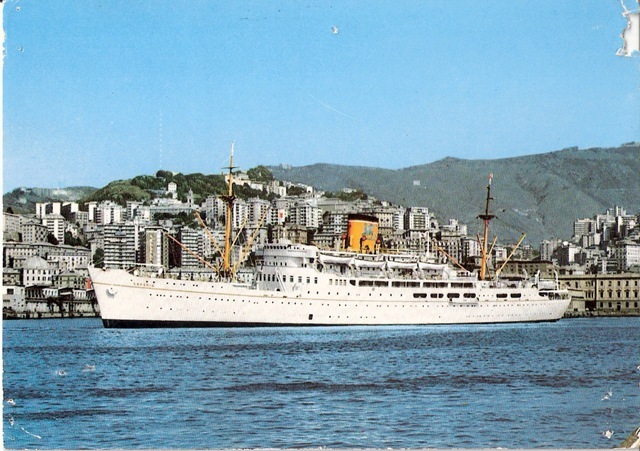 As for the Ausonia, she was refitted and extended a number of times, transferred to new owners and twice given a new name but she remained as a holiday cruise ship until quite recently. Sadly though she was eventually decommissioned, laid-up, sold off and arrived in India for scrapping in March 2010. Arrivederci Ausonia! Sadly it sunk in the Malacca Straits in 1999 due to engine fire.